Hidemi Suzuki creates a dashing flow of energy in the orchestral ritornellos of outer movements, and the Bach Collegium play with great zest and enthusiasm. 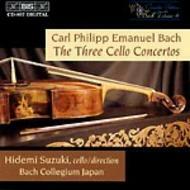 In slow movements Suzuki's eloquent phrasing, warmth of feeling and breadth of tone are totally compelling, a cello line of heart-stopping intensity. The recording is splendid.